Out of commission since March 23, the Wayback Machine chairlift at Mt. Abram has been undergoing repairs. In a recent communication to skiers, Mt. Abram announced it expects repairs to the Wayback Machine chairlift to be completed in time for the 2014-15 season. A Hall double chairlift originally installed in 1970, Mt. 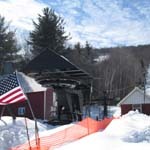 Abram's main chairlift was shut down just before noontime on March 23, 2014 due to a bottom bullwheel bearing failure. The summit of the ski area was unavailable for the rest of the season, as the Maine T-Bar had to be used to service upper mountain terrain. According to the Lewiston Sun Journal, work on the Wayback Machine began on July 21, 2014.